I’ll never forget the first time I heard about Goalball. My high school basketball coach arranged for my team to meet with Jen Armbruster, a member of Team USA Goalball, that won a gold medal at the Paralympics in Beijing, China in 2008. As we walked into a room generally used for the football team meetings, I had no idea what I was about to hear. My basketball coach asked Jen to come speak with us, because we were having communication issues on the court. One of the characteristics about Jen I remember the most was that she is funny. As she shared her life story, she added humorous bits that entertained us high school kids (which as a prevention educator in high schools I now realize this task is quite hard at times). I also felt a sort of connection with her, because she had grown up playing a lot of sports just like me. At that moment in time, I was around the age she was when she started losing her vision. 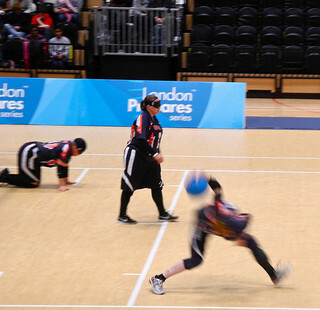 If you aren’t familiar with Goalball, it is fascinating! Players use their listening skills to determine where a three-pound ball is flying and to stop the ball from entering their team’s net. Three pounds may not seem like a lot, but think about how much a basketball weighs. A standard women’s basketball weighs 20 ounces while a standard men’s basketball weighs 22 ounces—and both types hurt when they are hurled toward you! With a goalball bells are placed inside the ball to help players hear where the ball is rolling. After Jen spoke with us, my coach divided us into teams and placed us 3 against 3 (typical Goalball competition). We then obstructed our vision with the use of blindfolds and began playing Goalball. For true Goalball players, sophisticated types of goggles are worn. We processed after and many of the comments centered on how frustrating and challenging it was to play without our eyesight. Referring back to my team’s communication issues, the goal was that we would learn new communication skills (or at least understand the importance of communicating during our games). Meeting with Jen that day was more than just learning and playing a new sport; the day broadened my awareness that it is everyone’s job to use their abilities to effect the lives others or in this case my basketball team. Thanks, Jen! What’s your favorite paralympic sport? Who is your favorite paralympic athlete? Currently completing: MA University of Alabama at Birmingham in Counselor Education BA University of South Carolina in Sociology/Business Administration Minor Growing up I was always active due to the healthy role models in my family. I played many sports, but finally narrowed it down in high school to volleyball (freshman year), soccer (sophomore year), and basketball (all four years). Basketball will always be my clear favorite as I began playing AAU travel basketball in fifth grade. In college, I decided to stick with the intramurals (my favorite was dodge ball)! Currently I am serving in AmeriCorps as a Healthy Relationships Instructor providing preventive education in middle and high schools. I firmly believe that health transcends further than our physical care. In September, I will be starting a second term of AmeriCorps and splitting my time between two local non-profits. One organization is Girls on the Run, an organization that inspires young girls to be confident and healthy through an experience-based curriculum and exercise! My favorite workouts include hiking, yoga, walking my dog, and playing basketball. When I have more free time I enjoy swimming laps!